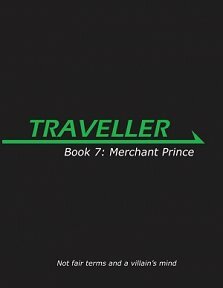 Publisher's blurb: "Long-awaited by Traveller fans, Merchant Prince is for every character who engages in trading while roaming the stars. Starting off with some extra tips and options for the speculative trading every Traveller player is familiar with, Merchant Prince adds a whole new trading option for those wealthy enough to attempt it, allowing them to build a huge trading empire that spans the stars. With new career options, cargoes and ships, Merchant Prince is an invaluable companion to all Traveller players. "This book not only allows players to make the most out of Merchant characters but also adds several new elements to the rest of the Traveller gaming system. Where some players may want to earn their living dodging bullets and spending as much as they make on armour repairs, some enjoy a more social or economic approach that can be just as exciting. "This sourcebook gives a host of new options, rules and plot potential. Traveller fans can find new boons within the game's economy based career paths, the companies they create and the market they live and die for. "Merchant Prince is a guide to making a fortune using the tenets of the merchant class."